The island of sparkling white sand beaches, turquoise waters and never-ending sunshine that will make you want to cancel your flight home. Aruba’s trademark slogan is “One Happy Island.” I usually take these types of slogans with a grain of salt, but let me tell you that Aruba truly walks the walk and talks the talk. My accommodations on this short, 3-day weekend of fun in the sun simply can’t be beat. 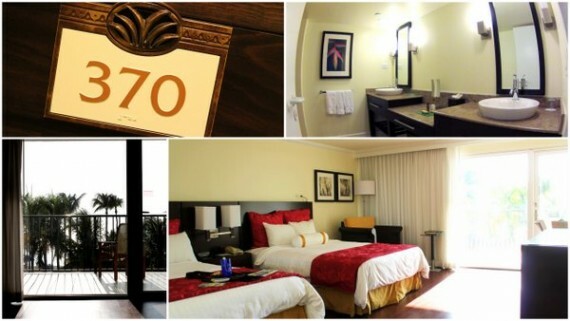 How does a premium ocean view room at the Aruba Marriott Resort & Stellaris Casino sound to you? Well, I’m happy to tell you that my stay was everything I could have asked for and more. Interested in a swim up bar, playing a little pool volleyball or standing under a cascading waterfall? Head on over to the main resort pool shown below. Looking for a more quiet and relaxing environment on the resort? 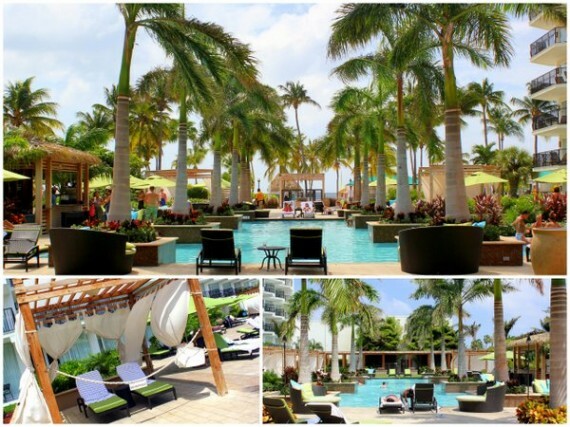 Make your way over to the stunning H2Oasis adult only pool. Bonus points go to those who secure themselves a private cabana! Are you the adventurous type? I only ask because there are so many great activities to participate in whether it’s in or out of the water here in Aruba. Below, you will find a list of four fun activities that I took part in during my recent visit to Aruba. Who knows, maybe I’ll inspire you to try your hand at one or two of these activities the next time you’re in Aruba! If you’re not a certified diver, the next best way to discover Aruba’s underwater marine life is to sign yourself up for a half day snorkel sail with Red Sail Sports. 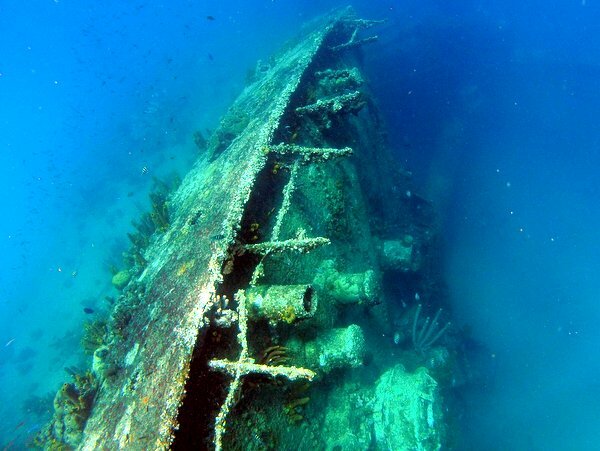 The half day tour will take you to three snorkel spots including Catalina Bay, Antilla Wreck and Arashi Reef. My personal favorite of the three stops was the Antilla Wreck, a 400 ft German merchant ship which sunk during the outbreak of World War II. To this day, the Antilla remains as one of the largest shipwrecks in the Caribbean. Whether you’re new to snorkeling or an underwater veteran, Red Sail Sports will take you out to sea and make it a day you’ll never forget. Note: I highly recommend these guys simply due to the fact that they are top-notch professionals when it comes to safety and customer service. Have you ever heard of beach tennis? Me, neither. Supposedly, it’s one of Aruba’s most popular sports. I had the opportunity to take a beach tennis lesson from a local pro at Beach Tennis Aruba. During the lesson, I learned the proper form, how to hold the racket (yes, there’s a proper way to hold the racket), how to serve the ball and much more. Beach tennis looks pretty simple from the sidelines but let me tell you that it’s a lot tougher than it appears! 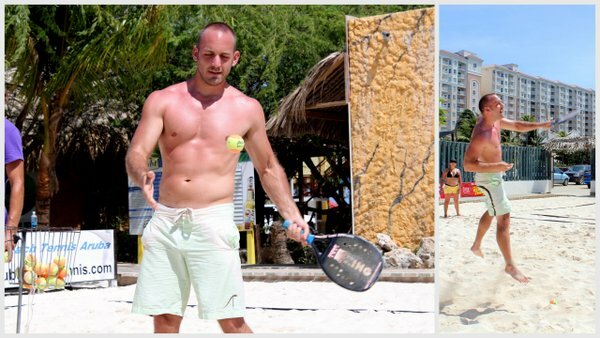 If you’re looking to start your morning with a nice sweaty workout like I did, head on over to Beach Tennis Aruba and sign yourself up for a lesson or two. Those of you who are familiar with traditional spinning will love this one. The aqua spinning class here at Aqua Windie’s is taught by a friendly dutch marine who really knows how to get your muscles moving. The only problem I had was that I didn’t find the aqua spinning class to be that difficult. It wasn’t until after I got out of the pool that I realized I could have adjusted the resistance on the bike which would have enabled me to have a tougher workout. Oh, well! Yogis rejoice! Thanks to Vela Windsurf Sports and Rachel Brathen Yoga, you can now take (SUP) Paddleboard Yoga classes in Aruba. My friends and I had an incredible time practicing our Paddleboard Yoga moves out on the Caribbean Sea. To say that it was tough is an understatement. We all fell off of our boards and into the water on more than a few occasions. Our instructor, Rachel, gave us some great advice before starting our class. She said, “If you fall in, just remember to come up smiling and everything will be alright.” She was spot on. We finished up our Paddleboard Yoga class with one last yoga mountain pose. I took an inhale followed by a deep exhale. Upon opening my eyes, the sun was setting over the horizon in the distance. Oh, what a life! Note: Our instructor, Rachel Brathen, is the only Paddleboard Yoga instructor in Aruba and shes excellent! Big thanks to Rachel for showing us how it’s done! If you’re interested in learning more about Paddleboard Yoga please contact Rachel on her Facebook page: Rachel Brathen Yoga Lifestyle. If you’re interested in simply renting a paddleboard and doing your own thing, you can rent one over at Vela Windsurf. After you get your fair share of exercise from some of the activities listed above, you are going to be one hungry vacationer! I am not about to go into incredible detail about each establishment, but I’ll list a few of the places that I think you should visit the next time you’re in Aruba. 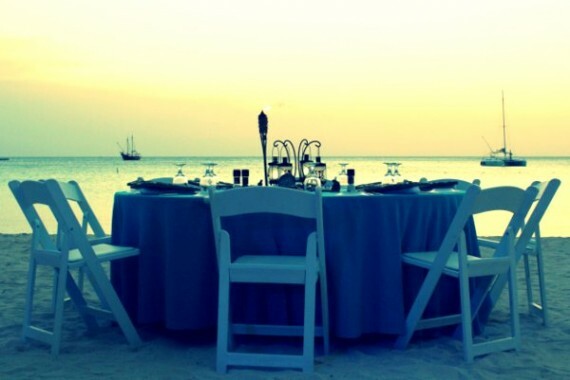 Located on the shore of the Aruba Marriott Resort is Simply Fish, one of TripAdvisors Top 10 Must Dine at Restaurants in Aruba. The seafood is supposed to be off the charts! If you’re not crazy about seafood, I recommend you go for the grilled Angus Steak. Pinchos is a delicious, family run, outdoor restaurant and bar located on a pier at the Surfside Marina. Take your significant other here for a romantic sunset dinner and you’ll be collecting those brownie points like never before. Not too many tourists know about this gem of a restaurant. 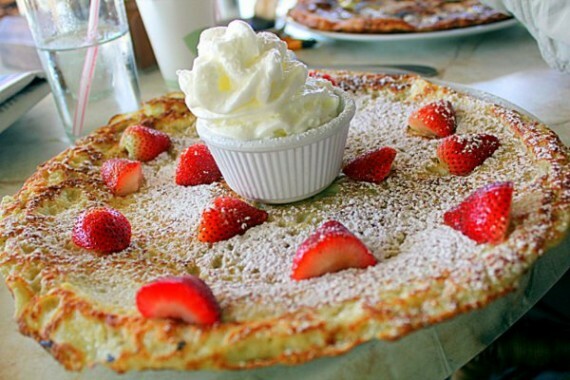 Linda’s Dutch Pancakes & Pizza serves scrumptious dutch pancakes with all sorts of toppings ranging from Bacon & Apple, Peanut Butter & Jelly, Strawberries & Whipped Cream, Banana & Chocolate and even completely customized pancakes as well! I’m told that Linda’s also offers incredible pizzas as well. 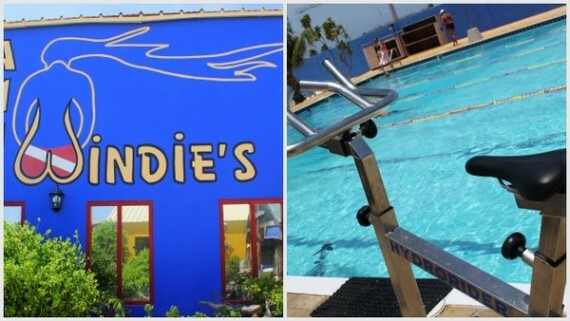 Whether you’re in the mood for breakfast, lunch, or dinner, be sure to check out Linda’s next time you’re in Aruba! 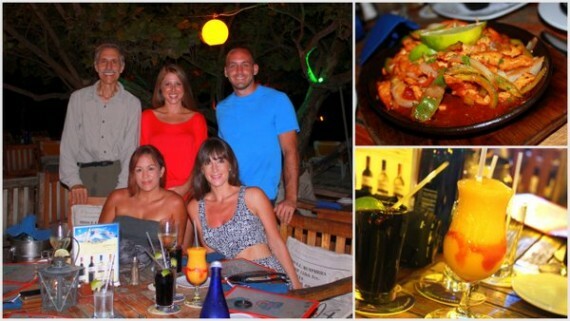 Our last night in Aruba was spent dining at the tasty Moomba Beach Bar & Restaurant. 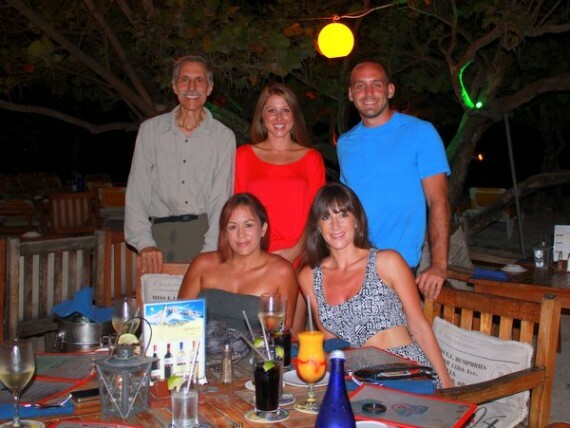 I wouldn’t go as far as to say that this was our best dinner in Aruba but it was certainly up there. 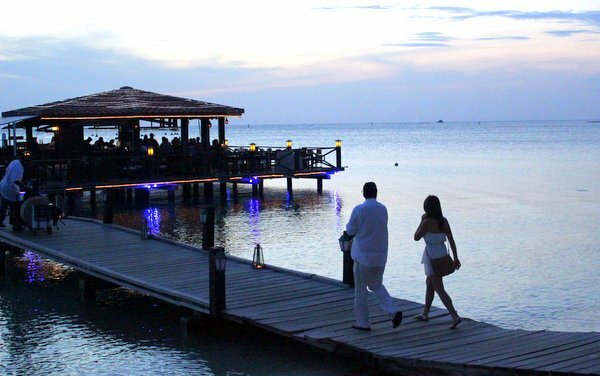 There’s something to be said about dining on the beach in Aruba and the Moomba Beach Bar & Restaurant knows how to make its guests feel right at home. If you’re looking to cool off and grab a really refreshing drink after a long day in the blazing Aruba sun, I highly recommend the mango smoothie. For dinner, I recommend the Chicken Fajitas as shown in the photo above. Yum! Although it was a short trip, I really enjoyed my time in Aruba. The people, the food and all of the new travel friends that I made along the way really made my visit to Aruba that much more enjoyable. Ed, Kristy, Jody, Lisa, and I – Missing from the photo is Jason, Debbie and Keirsin! Of course, staying in an ocean view room and being able to watch the sunset from my private balcony at the Aruba Marriott Resort was just the icing on the cake. If you are headed to Aruba and you have any questions, please feel free to contact me. Have you been to Aruba? What activities did you get involved in and what is your favorite restaurant on the island? Thanks a lot Seattle! Aruba was great. I’m jealous of your Hawaii travels though! Pause the Moment: Making cubical rats miserable since 2006. Hahaha! You’re the best man. beach, sports, strawberry cake … looks like paradise to me! Thanks Micamyx! I appreciate your feedback. Let me know when you book your trip and I’ll answer any questions you might have. My family is having a vacation at Aruba this coming December. We will celebrate Xmas at the white sandy beach on the western coast. Can you recommend a good hotel to check in? Good luck! 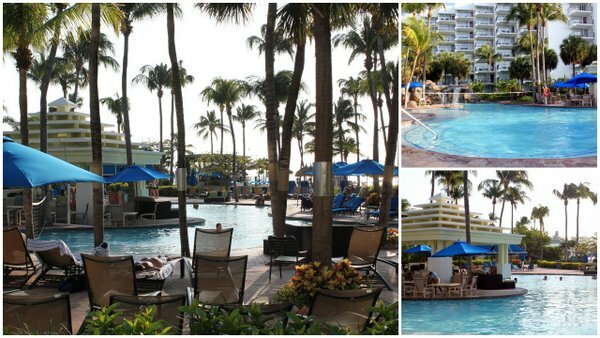 I highly recommend the Aruba Marriott Resort. I didn’t know Aruba has a good snorkeling site there. Lovely photos of the white beach and great resort in Aruba! I wish I could go there very soon! Same here Mike. I had no clue until we pulled up to the wreck. Talk about a surprise! The Aqua Spinning looks awesome! And I would love to snorkel there. Looks like a great place, but wondering if you’ve been elsewhere in the Caribbean and how it compares (i.e. 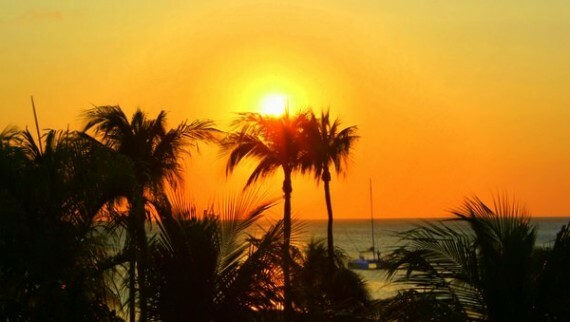 why should someone choose Aruba over elsewhere, since they likely have similar activities and natural wonders). Yeah the Aqua Spinning was just OK for me. It wasn’t half as hard as I had imagined it would be. I don’t think the resistance was set correctly on my bike. As for it being different, definitely. Much different than lets say St. Kitts. Both are great! Thanks a lot Rachel! Every moment is definitely an adventure, that’s for sure. Awesome place, I am dying to do aruba activities like this. Aruba I am coming! 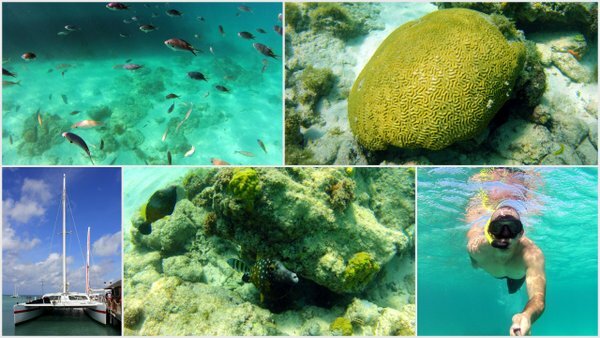 Aruba Snorkeling and diving is the great experience as there are professional with visitors and full equipment to explore the main area of the sea where you can enjoy the most and can’t forget it. Kids will enjoy the most of it. Aruba activities will ensure you have a fantastic time, Really Aruba’s Beach are very beautiful beaches and there are many things to do it. What I love a lot about Aruba is their florin banknotes. They’re so stylish, so artistical. The banknotes themselves are great souvenirs. Never been, but would love to go – paddleboard yoga looks fun! Yes, paddleboard yoga is definitely worth a try! I spend 4 days in Aruba last year. Oranjestad, Butterfly Farm, hiking in Arikok Park and Eagle Beach made it impossible not to fall in love with Aruba. Amazing! Glad to hear you had a great time.